It’s an overcast and somewhat rainy day here in the Midwest and it’s clear that we are in a seasonal transition. Summer has left its mark and boy was it a good one, full of newborn snuggles and family adventures. As sweet as that time was, we are eager for cooler temperatures, for morning walks amongst the crunchy autumn leaves, stews for supper, and more sturdy routine when it comes to how we structure our days. I am also ready to spend more time sharing here too in this journal of mine. Stella will be starting preschool next week (!) and so I have been spending our most recent days figuring out what our new rhythm will look like here at home. One way I am able to clear my mind and really reflect is to have a clean and tidy space. Since we have been in our home for one year now, I have been able to really find a proper place for everything, cleaning tools being no exception. Because scrubbing and tidying and organizing is part and parcel of a stay at home mama’s job, I have made it a point to be intentional in finding joy in those tasks. Such things like beautiful but practical tools with easy accessibility help make my time cleaning more enjoyable. With alfie wrapped up and snug on my chest, and the older two running about the yard or watching an episode of Peter Rabbit, I’ll start my cleaning routine by making something in the crock pot for supper. Tonight we are having thai curry chicken over coconut rice, an easy favorite. I like crock pot meals on days when I am giving everything a good scrub because the clean up after we eat is nothing more than a few plates and some silverware. The mess of meal-making is taken care of throughout the day as our supper cooks in one little pot. No mess and time to do other things! That makes me happy. After having prepared our supper, I’ll throw on some music, usually David Gray or Louie Armstrong or Patsy Cline, and diffuse oils around our home to help cleanse the air. Today I did a mixture of thieves, nutmeg, and orange oil. Not only does it smell like Autumn in our home, but it gets rid of pesky germs, too. A real win-win. After having set the stage for my cleaning spree, I’ll start with the dishes, do all surface areas, and sweep and mop the floorboards. I’ll put a couple of drops of lemon oil on a warm wet rag and scrub everything down, no counter top being left unscrubbed. Sometimes I’ll substitute thieves oil for this, it just depends on my mood. Lemon helps cut the grease so I tend to use that more often in the kitchen. When moping the floors, I’ll add a few drops of tea tree oil to the mop rag and several drops of orange to make them shine and smell lovely. At the end of my cleaning routine, I’ll soak my brushes in a mixture of vinegar, water, and essential oils (today I used rosemary) to keep them fresh and clean. During this time I’ll do a load or two of laundry, adding purification oil to the wash and spraying lavender mist on clothes when they’ve dried. Now that we have three little ones, laundry is a daily task, so keeping up with that is a must for my mental clarity. Aiming for one load a day has been the trick to keeping things manageable around here. And then there’s the bathrooms, my least favorite. I’ll do these one a week, often times neglecting the shower and leaving that for a twice a month job. I should probably scrub the tiles in there more often, but I don’t. On the days that I do get to those tiles, I’ll also wash our sheets and top layers of bedding. Since most of it is white I am able to put it all together using a non-bleach alternative to get them looking really white. The Laundress makes a good one. If it is sunny on days that I get to this chore, I’ll line dry our linens. If not, a good tumble in the dryer is good, too. So there you have it. It’s moments spent doing such cleaning tasks around our home that help recharge me as a mom. Since we live pretty simply and have eliminated clutter when we moved here, it takes about an hour, sometimes two, to really clean it. 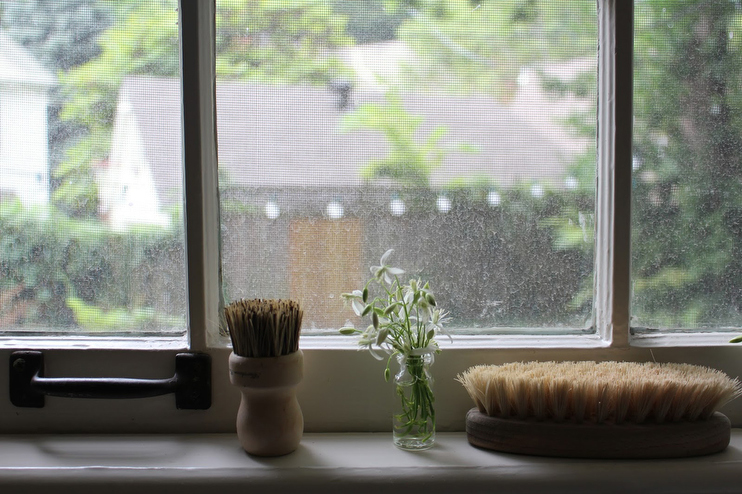 Keeping up with this routine several times a week also helps keep that time to a minimum, rather than forgoing cleaning for many days and having to tackle one big mess, taking hours away from our day. I have found that this all works well for us. It gives me time to clear my head and also make our home a place we truly enjoy. Love love this post. Just discovered your blog recently actually. I am a long time follower and am continuously inspired by you and the simple, meaningful life that you lead at home with your family (I mean that as the biggest compliment)! I too find white the most soothing and comforting colour. When I first renovated and moved into my now home, I had many others second guessing my choice to paint all of the walls white. They thought it would look to stark and clinical. But I knew I had made the right choice and after some time (and some simple accessorizing), they too came to their senses! As for the cleaning brushes, unfortunately, I live in a very small town and finding them is very hard. I also live in Canada, so shipping from an American website can be quite pricey. Do you know of any Canadian retailers that sell similar products? Thank you so very much, Amanda, and I look forward to reading your blog for many many years to come! Can you expand on mopping? Do you do this daily and what type of mop do you use? Do you use soap or just water and oils?